The design of products from the 1950s through 70s were illuminated by designers like Charles and Ray Eames, Eero Saarinen, and Eliot Noyes. Their iconic works, such as the IBM Selectric Typewriter and the distinctive Westinghouse Electric Manufacturing Company logo, stand as testimony to why corporations in the post war period needed the skills of graphic, industrial and architectural designers as well as mechanical and electrical engineers. In 1957, recognizing the need for design education in Stanford’s curriculum, provost Frederick Terman hired John Arnold from the Massachusetts Institute of Technology (MIT) to lead the effort. Arnold became founding director of the Design Division and began executing on his vision of human centeredness and creative engineering. Arnold next hired two PhD students; Robert McKim (Pratt) and James Adams (Cal Tech & UCLA), and together they laid the foundation for what became Stanford's “Joint Program in Design” (JPD) a multidisciplinary program combining engineering, art, and creative problem solving. When Sindey Parnes, Ruth Noller and Angelo Biondi compiled their encyclopedic, 400 page, Guide to Creative Action in 1977, they cataloged the work of dozens of academics and researchers studying creativity. Parnes also contributed writings on problem solving methods and idea generation techniques which discussed the Osborn-Parnes Creative Solving Process. 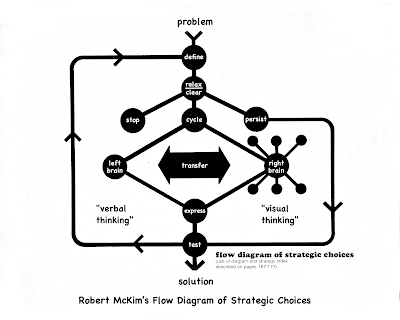 Guide to Creative Action refers to McKim's Experiences in Visual Thinking as a "classic" and included a full chapter on Relaxed Attention because it "stressed the nature and importance of of relaxation and attention in the creative process" and as an introduction to "valuable exercises in visual thinking." 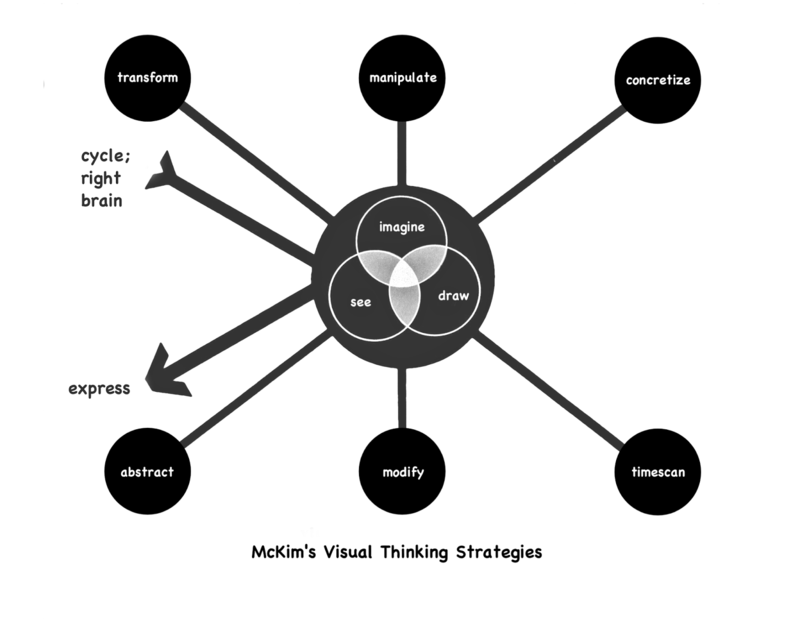 We may never know exactly why Parnes, Noller and Biondi selected only those six pages of Experiences in Visual Thinking for inclusion and ignored McKim's other 21 chapters. Fortunately, we have access to all of Experiences in Visual Thinking. In the Introduction, McKim immediately turns to thinking; asking what is is, how to observe it in ourselves and the importance of flexibility in thinking. 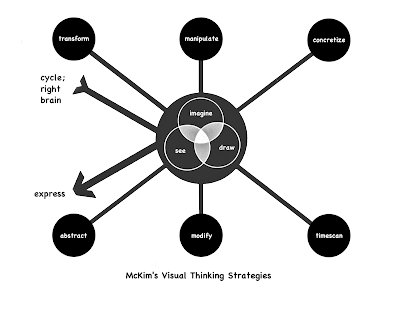 From there he develops and explores some background and preparation for the process of thinking visually and then dives into the process of using visualization, imagining and idea-sketching in problem solving. 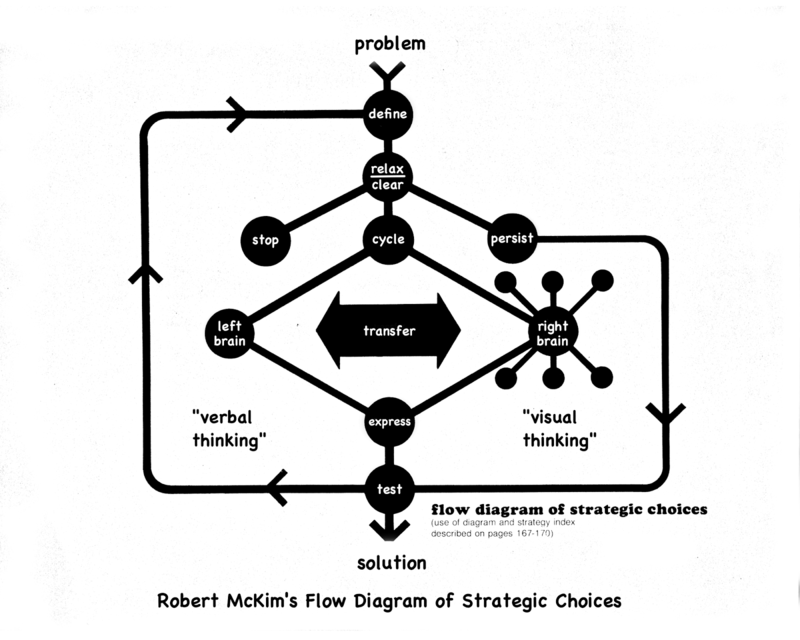 These images lack the raw simplicity of McKim's Express-Test-Cycle view of problem solving, but provide significant insight into his ideas of a comprehensive problem solving process utilizing imagining, drawing and seeing. 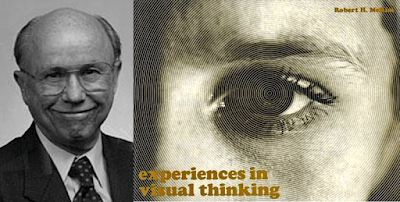 Still in its second printing, and available on Amazon, Experiences in Visual Thinking is a still a valuable reference after over three decades.